“Taking deep breaths is healthy” is a common saying. The Buteyko-method proves the opposite to be true. The author, Arend Hoiting, has experienced first-hand that breathing less can in fact heal you. The book ‘Breathe less – heal yourself’ will help teach you how to support the self-healing power of the body. This book was published by Boekscout. First edition in 2016 and the second edition was published in January 2018. The Buteyko-method is a scientifically substantiated breathing method which proves that the opposite is true. Breathing less deeply heals a lot of diseases, such as high blood pressure, Angina Pectoris, asthma, allergies, sleeplessness, sleep apnea, chronic fatigue, depression, burn-out and chronic and acute hyperventilation. Typical for the Buteyko-method is breathing through the nose while at rest, moving, and speaking. The Buteyko-method supports the self-healing abilities of the body. Arend Hoiting has healed himself with the help of the Buteyko-method. He had an extremely high blood pressure (250 over 150) for years and blocked arteries on the heart muscle (small vessel disease). Without medication, but by using the Buteyko-method his blood pressure normalized and in 2012 it was also shown that the arteries on the heart had become unblocked. Arend also has experience with guiding cyclists, with visible results being perceptible due to consistent breathing through the nose. Better performance and less or hardly any acidification in the legs. In this book he gives practical advices for working with the Buteyko-method. 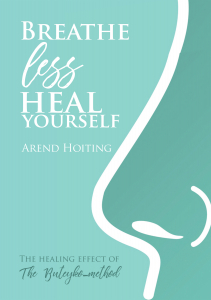 I’ve been reading this book “Breathe less Heal yourself” by my Dutch colleague Arend Hoiting and love Arend’s dedication. I can clearly feel his engagement and passion for the Buteyko Technique. I do not hesitate to recommend the book to clients – especially those suffering from heart problems – and so much more. Arend is taking us through his own problems and how he solved them by way of the Buteyko Breathing technique. This is why the chapters on heart and blood pressure captors you. The language is clear and easily understood. Also the final chapter on breathing while speaking is of great interest to all of us. The focus on breathing while speaking is as important as it is something that we do all the time and goes very well with Arends focus on cycling and other sports. It is so important to pay attention to breathing while moving, it could be cycling, running, any kind of moving we need to have the right breathing technique. There is also a valuable chapter on insomnia, snoring, fatigue and Chronis Fatigue Syndrome. I think the book is not only important for students of the Buteyko Breathing re-retraining but for client and people with focus on health and breathing. For students it is a nice supplement to the method and can be an excellent way into breathing for the curious person. I appreciate the new studies on cancer Arend is pointing my attention to, getting to reconnect to the theories of Dr. Otto Warburg which is important. What would I have wanted more? A striking thing in Africa while teaching local teachers on behalf of the Dutch Ministry of Foreign Affairs was their normal breachting pattern while in rest. In the industrialised world we sit on our chairs all day and have a breathing pattern as if we cycle in contrast to people in Africa, being more “orginal”! Also I would have liked a little about adrenaline and noradrenaline with asthma. For newbies it could be a topic to touch upon. It may come in another book! What I took away from the book was the excellent chapter of cholesterol for cardiovascular diseases and Sports and EPO … and all the rest. This sentence from the book is right on so many levels. Arend Hoiting of The Netherlands, was trained as a Buteyko Specialist in 2008/2009 by Masha Kotousova, a student of the late Dr.Buteyko and she is lecturing in The Netherlands. Igor Apukhtin, editor in chief of the Nevsky News Agency and lecturer of the St Petersburg University, made a documentary about Arend’s personal experiences with Buteyko breaching through the nose while inhaling hard to master while speaking especiallially when feeling positive or negative emotions. Arend is the only person in Europe who healed himself from blocked arteries on the heart ( in medical terms it is called ” small vessel disease” ). In 2011/2012 it was proven that the arteries were open and clean during a cardiac catheterisation. In a medical sense it was impossible according to the cardiologists in the hospital in the town of Groningen. His extremely high blood pressure in the years 2007-2010 was treated by 12 medicines a day and didn’t give any result. The bloodpressure came down after using the Buteyko method within 2 months. His healing is absolutely unique. His wife healed herself from severe asthma and the both of them ascended many mountains in southern France. On the 28th of August 2018 Arend ascended the famous Mt Ventoux ( some people call this mountain notorious ). 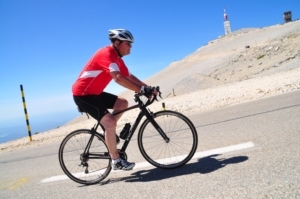 The mountain Mt.Ventoux is 1909 m and its slope is up to 10%.